The word "Freestone" conjurs images of rivers like the Maddison, Roaring Fork and Yellowstone. Wild rivers where big wild trout chase down sculpin or ambush wayward grasshoppers. Rivers with abundant hatches of caddis, mayflies and stoneflies. 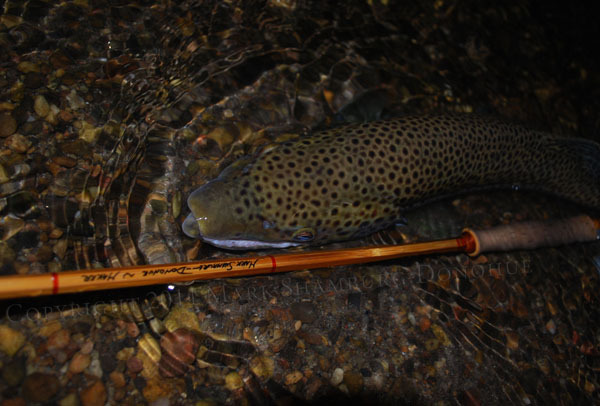 Rivers that require a serious bamboo fly rod. And the Confluence "Freestone" is just the rod for those rivers. In addition to having the power needed to fish these big western rivers, the "Freestone" has the delicacy to comfortably fish even a small stream as well. The Freestone's versitility stems from its smooth taper: a moderately fast, progressive action that casts well accross the board. The "Freestone" truly is the perfect 6 weight.